This cleaning system is still one of my favourite cleaning products to have on hand. Easy to put together. Perfect for when a full mop isn’t needed and the smell will leave your house feeling fresh! A perfect cleaning accessory for every Mum! 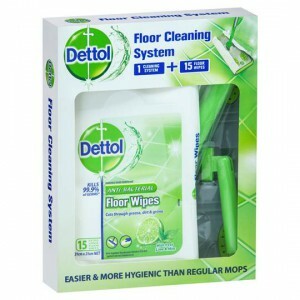 Dettol floor cleaner is quick and easy to use, it’s light weight and great for easy clean up, the wipes are simple and easy to attach making cleaning fast. This Floor Cleaner System is good for dust and mainly clean floors. It is a great way to clean between proper mopping days but doesn’t give a deep clean. Its a bit of a waste using disposible wipes too. Using this floor cleaner to clean the floor in my kitchen. It smells good, wipes are wet enough to use and strong, and mop is adjustable according to heights. So its a great product. We used this for a few weeks when we first moved out. For small surfaces areas this is usable however becomes incredibly tedious when needed for anything larger than a single room. The handle twists apart while you are trying to use it which is frustrating. The wipes work well. Super light, easy to use and store and perfect for children and pets and we love the fragrance. How would you rate Dettol Floor Cleaner System?